Fun video from the Canadian National Championships held in Thunder Bay, Ontario. Video courtesy of Alan Auld at Imagine Films. As you can see the scenery was spectacular. 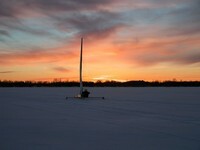 We sailed on beautiful ice, in a moderate breeze, with clear skies and 35 degree temps.